Today is the birthday of the Scottish poet Robert Burns (1759-1796). Born in Alloway, Scotland, on a tenant farm, Burns began writing poems at an early age. Although he had little formal education, suffered much poverty and hardship, and died at just 37 years of age, his poetry and songs have made him one of the great poets, especially to the people of Scotland who recognize him as their national poet. Even though he wrote his poetry in the Scottish dialect, today Burns’ poetry is read, remembered, and loved by people around the world. One prime example is his song Auld Lang Syne, which is sung around the world each New Year’s Eve (1). Beginning in 1801, five years after Burns’ death, his friends gathered at a dinner in Alloway to honor the Scottish Bard. Ever since, Burns’ admirers around the world have gathered on his birthday at Burns Suppers. More than just a meal, the Burns Supper has evolved into an elaborate, scripted event involving the playing of bagpipes, the presentation of formal speeches and toasts, and the recitation and singing of Burns’ poetry and songs. One vital menu item for every Burns Supper is haggis, Scotland’s national dish: a pudding made of sheep offal (the liver, heart, lungs), oatmeal, minced onion, all encased in a sheep’s stomach. Pipes play as the haggis is presented to the dinner guests, and before anyone digs in, Burns’ poem Address to the Haggis is recited. The highlight of the evening, however, is the keynote address called the “Immortal Memory,” presented by one of the attendees. The purpose of this speech is revive the memory of Burns’ life and to express appreciation for his work. 1-The Poetry Foundation. Robert Burns. https://www.poetryfoundation.org/poets/robert-burns. 2-Bartleby. Ralph Waldo Emerson. The Complete Works. https://www.bartleby.com/90/1122.html. On this day in 1854, Britain’s Poet Laureate Alfred Lord Tennyson published his poem “The Charge of the Light Brigade.” The poem recounts a horrific episode at the Battle of Balaclava during the Crimean War. On October 25, 1854, the British Light Brigade rode into battle against Russian forces. Following an ambiguous order to attack, the soldiers of the British cavalry were mowed down by Russian field artillery as they charged across a treeless valley. Of the 673 British horsemen who made the charge that day only 198 survived (See October 25: History Into Verse Day)(1). Narrative poetry is probably the oldest form of poetry there is. A narrative poem is a poem with a plot, a plot which centers around characters, conflict, and setting. The most common forms of narrative poems are the short form known as a ballad and a long form known as an epic. Accordingto Edward Hirsch in his book A Poet’s Glossary, these poems are some ofour oldest forms of storytelling. Many ballads and epics began as spoken formsof poetry, long before we had an alphabet that allowed people to write theirwords (2). 1- March, W.B. and Bruce Carrick. 366: A Leap Year of Great Stories. Cambridge, UK: Icon Books, 2007: 342. 2-Hirsch, Edward. A Poet’s Glossary. New York: Houghton Mifflin Harcourt, 2014: 397. 3-Tennyson, Alfred Lord. The Charge of the Light Brigade. 1854 Public Domain. Poetry Foundation.org. http://www.poetryfoundation.org/poems-and-poets/poems/detail/45319. On this day in two different years, 1415 and 1854, a historical battle was immortalized in verse. The first was the Battle of Agincourt in 1415 in which the outnumbered English army defeated the French in a major battle of the Hundred Years War. The battle took place on Saint Crispin’s Day, a feast day honoring the Christian saints Crispin and Crispinian. The English were led by their king Henry V who joined his soldiers in hand-to-hand combat at Agincourt. Though history does not record exactly what Henry said that day, William Shakespeare, in his play Henry V (Act IV, Scene iii), imagines what Henry might have said to spur the undermanned English to action. In a speech of 49 lines, Henry expresses his confidence that they will win and that each year as they near St. Crispin’s Day they will look back and remember their glorious victory and the bond they share with their brothers in arms (1). More than 400 years later in 1854, Britain and France joined forces against Russia in the Crimean War. On October 25, 1854 the British Light Brigade under the command of General James Cardigan rode into history. Following an ambiguous order to charge into a treeless valley surrounded by Russian field artillery, hundreds of British horsemen were mowed down as they swept across the open ground. Miraculously some of the horsemen managed to temporarily disable the Russian guns and return under fire across what would become known as “the valley of the shadow of death.” The charge, although courageous, resulted in senseless carnage. Of the 673 British horsemen who began the charge, only 198 survived (3). The British cavalry’s charge was immortalized in verse by Britain’s poet laureate Alfred Lord Tennyson. The poet penned the narrative poem on December 2, 1854 after reading an account of the battle in the British newspapers. On December 9, 1854 the poem entitled “The Charge of the Light Brigade” appeared in The Examiner. 1-March, W.B. and Bruce Carrick. 365: Your Date With History. Cambridge, UK: Icon Books, 2004: 526-7. 2-Shakespeare, William. Henry V. 1599. Public Domain. 3- March, W.B. and Bruce Carrick. 366: A Leap Year of Great Stories. Cambridge, UK: Icon Books, 2007: 342. 4-Tennyson, Alfred Lord. The Charge of the Light Brigade. 1854. Public Domain. On this day in 1833, the poet Alfred Lord Tennyson (1809-1892) completed his great dramatic monologue Ulysses. The voice of the poem, or its persona, is Ulysses, the Latin name of the Greek hero Odysseus. In writing this poem, Tennyson adopts the character Ulysses from Homer, the author of the Greek poems The Iliad and the Odyssey. The Odyssey is the epic narrative that follows Ulysses’ 10-year struggle to return home after the Trojan War. Once home on Ithaca, Ulysses faces another challenge: to outwit the suitors vying to win the hand of his wife Penelope. Displaying brawn but also brains, Ulysses defeats the suitors in a contest, slaughters them, reunites with his wife, and once again becomes king of Ithaca. The poem Ulysses imagines the hero years after he has returned to the throne. In the tradition of the dramatic monologue, we hear only the voice of the old king as he reflects on his past, on his relative idleness as King of Ithaca, and on his desire to once again set out on a bold adventure. The understood audience of the poem is the crew of his ship, the men who will join him on his new journey. Like much of the verse of William Shakespeare, Ulysses is written in blank verse, unrhymed iambic pentameter. 1-Tennyson, Alfred Lord. Ulysses. The Poetry Foundation. 1833. Public Domain. https://www.poetryfoundation.org/poems/45392/ulysses. Today is National Poetry Day founded in 1994 by British philanthropist and publisher William Sieghart. Although this “National” day is celebrated primarily in Britain, there is a definite case for making it a global celebration: It’s the birthday in 70 B.C. of the Roman poet Virgil, author of Rome’s national epic, the Aeneid. Virgil influenced the great Latin poet Ovid, as well as Dante, the major Italian poet of the Middle Ages. In Dante’s epic poem the Divine Comedy, Dante employs Virgil as his guide on his travels through Hell, Purgatory, and Heaven. In his own epic, the Aeneid, Virgil traces the travels of the mythical hero Aeneas, a Trojan prince, who becomes Rome’s great hero and father. Before his death in 19 B.C., Virgil supposedly left instructions for the Aeneid to be burned. Emperor Augustus, however, wouldn’t allow it to be destroyed; instead, he ordered two of Virgil’s friends to edit it, and two years later it was published (1). The purpose of National Poetry Day is the reading, writing, publishing, listening, and teaching of poetry; it’s also a nice day to plan ahead for spring when Poetry Month is celebrated. Each year organizers select a theme to kick off inspiration. The theme is not meant to be prescriptive, but it can help spark one’s memory of poems from the past as well as ignite imagination for creating new poems. One excellent way to celebrate National Poetry Day is by putting together a thematic anthology of poetry or poetic prose. The word anthology in the original Greek meant to gather flowers: anthos “a flower” + logia “collecting.” Today we use the word metaphorically, the flowers being samples of the best verse by various writers gathered into one beautiful bouquet of a book. 1-Williams, Robert Deryck. Virgil. Encyclopedia Britannica.com. http://www.britannica.com/biography/Virgil. 2- National Poetry Day. What is National Poetry Day? https://nationalpoetryday.co.uk/about-npd/. 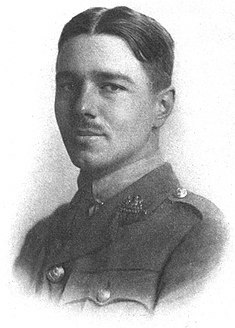 On this day in 1917, Wilfred Owen (1893-1918), an English soldier recovering from shell shock, composed the first draft of the poem “Dulce et Decorum Est.” The poem is one of the most vivid, realistic depictions of the horrific trench warfare of World War I and is one of most powerful rebuttals every made to the argument that it is valorous to die for one’s country. Owen joined the army in 1915, and after he was wounded in combat in France in 1917, he was evacuated to a military hospital in Edinburgh, Scotland. It is there that he penned the first draft of his poem and sent it to his mother with a note: “Here is a gas poem done yesterday, (which is not private, but not final)” (1). The words from Horace that Owen calls “The old Lie” would have been familiar to Owen’s readers since they were often quoted during the frenzy of recruiting at the beginning of World War I. These Latin words are also inscribed on the wall of the Royal Military Academy Sandhurst in Berkshire, England. In the United States, the words are etched in stone above the rear entrance to the Memorial Amphitheater, near the Tomb of the Unknown Soldier, at Arlington National Cemetery. After his recovery, Owen rejoined his regiment and returned to the trenches of France. He was killed in battle on November 4, 1918, one week before the war ended on November 11, Armistice Day. Owen’s poem is a rebuttal — the presentation of contradictory evidence — to an ancient expression of conventional wisdom, as seen in Horace’s Latin exhortation (here translated into English): How sweet and honorable it is to die for one’s country. 2- Owen, Wilfred. Dulce et Decorum Est. 1921. Poetry Foundation.org. Public Domain. https://www.poetryfoundation.org/poems/46560/dulce-et-decorum-est. Today is the birthday of American poet Wallace Stevens (1879-1955). Wallace won the Pulitzer Prize in 1955 even though he never worked as a full-time poet. His day job was as an executive for an insurance company in Hartford, Connecticut. One of Stevens’ best-known poems is “Thirteen Ways of Looking at a Blackbird,” published in 1917. The poem captures the essence of poetry, a form of writing that challenges both the writer and the reader to “look” at the world from different perspectives and to see it in new ways. In the tradition of Imagism, a poetic movement that emphasizes precise imagery and clear, concrete diction, Stevens presents thirteen numbered stanzas, each featuring a different way of seeing the ordinary blackbird (1). Description: Create a picture in words of what it looks like, sounds like, feels like, smells like, and/or tastes like. Comparison and Contrast: Explain what is it like and what it is not like. Cause and Effect: Explain where it came from and how it impacts the world. Definition: Explain exactly what is it called, what it means, and what makes it distinctive from other things. Narrative: Tell a true story related to it that involves real people in conflict. Exemplification: Make a generalization about it; then, support the generalization by giving specific examples that illustrate and explain it. Argumentation: State a claim related to it, and provide reasoning and evidence to prove your claim is valid. Problem and Solution: Explain conflicts that arise because of it, and how those conflicts can or might be resolved. Process: Explain how something happens related to it by giving a step by step sequence. Division and Classification: Identify its different parts and its different types. Poetry: Explore ideas related to it in verse, using imagery and figurative language. Fiction: Create a story about it that has a narrative point of view, characters, conflict, climax, resolution, and theme. Drama: Create a dramatic situation around it, with character, conflict, dialogue, and theme. Today is the birthday of Donald Hall, American poet and the 14th U.S. Poet Laureate. He was born in New Haven, Connecticut, in 1928, and when he was only sixteen, he attended the Bread Loaf Writers’ Conference. In his 50-year career as a writer, Hall has published poems, essays, letters, children’s books, and literary criticism (1). In 1985 Hall wrote a short essay for Newsweek‘s “My Turn” column entitled “Bring Back the Out-Loud Culture,” where he challenged readers to return to reading and reciting aloud. Hall looked back to a time before television and mass media when print was frequently read aloud and everyone learned something by reciting or listening to recitations (2). 1 – Poets.org. Donald Hall. http://www.poets.org/poet.php/prmPID/264. 2 – Hall, Donald. “Bring Back the Out-Loud Culture.” Newsweek 15 April 1985: 12.